When Rita Rosenback from the blog Multilingual Parenting asked other bloggers to share their best tips for motivating children to speak the minority language for the upcoming round of the Raising Multilingual Children blogging carnival my first reply was quite straightforward: playing! Since my youth NGO days I’m a firm believer in learning by doing. As the famous (and rather corny) quote goes: “Tell me and I forget, teach me and I may remember, involve me and I learn.” Although true for pretty much everyone, I believe it is especially important for children to learn by experiencing various things and by trying everything out by themselves. Particularly for toddlers learning by doing means learning by playing. Play is how these little humans learn about the world around them, develop their physical skills, practice social skills, expand their cognitive abilities, deal with various emotions, and so much more. Toddlers play everywhere and with everything. During this time when Birdy is trying to master our family’s languages, learning by playing particularly applies to her language skills. Playing together is a great way to teach her new vocabulary and to get her speaking the language. Let me give you an example. For the past few months our little one has been particularly interested in colors and numbers. Her German-speaking daycare has done a wonderful job in introducing these through various finger games and a whole color week where the kids wore a different color every day, played color-related games, sang color songs, and did color crafts. Pretty cool, right? Seeing her willingness to learn, it was up to me to teach her colors and counting also in Latvian, our family’s minority language. The most obvious thing to do would have been acquiring some new books on the topic but, as much as we both love going through books, there’s only so much reading one can do with an active toddler. Fortunately I quickly discovered a much more fun play for learning colors and numbers: Lego Duplo! These colorful little blocks and not only good for developing motor skills and imagination, they are also perfect for learning new vocabulary. As Birdy loves playing with Lego it was so easy to incorporate color and number words in our playtime. 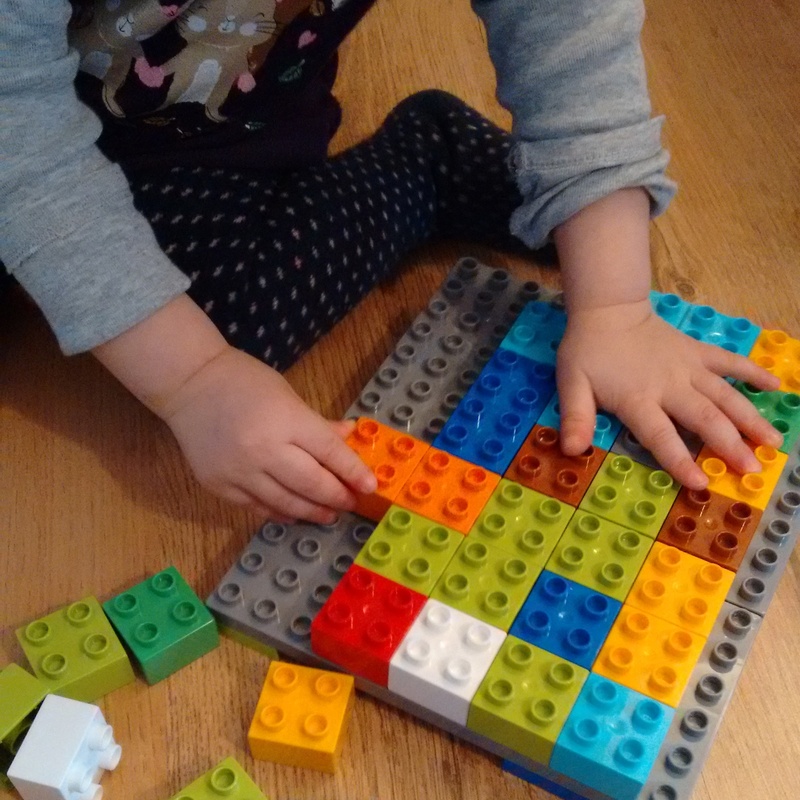 After a few weeks of sorting the blocks by color, counting the height of towers, and arranging them in a myriad of other ways she had her colors figured out and was well on her way to learning to count to ten. My only concern was that there’s not more different words in Latvian for light and dark blue, and light and dark green as these shades look more different from one another than yellow and orange. What I simply called “playing” at the beginning of this post is probably best described as a combination of two things. On the one hand, it is what your toddler is interested in learning. On the other hand, it is what they are particularly enjoying playing with. If you find a way to combine the two leaning new vocabulary and speaking it with you will be as easy as pie.